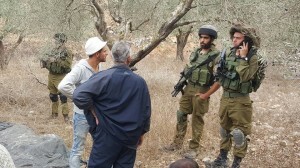 Urif families were informed that they were to have a permit to pick olives on 26th and 27th October ´15 on their land in zone B bordering but alongside zone C.
Four families arrived at about 8am on 26th and just after 9am a settler security car arrived and the farmers were informed via the loudspeaker to stop the harvest and leave the area. 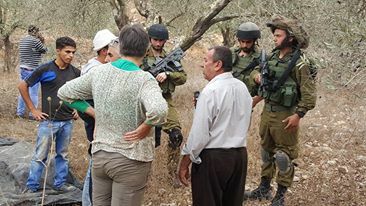 Farmers continued to pick and one of them told IWPS that settlement security should not come to their land because it is outside the boundaries of the land the settlers have taken. About 10 minutes after an army jeep arrived and three soldiers came to the olive grove repeating that the farmers should leave because according to them, the farmers did not have permit to pick on 26th and 27th and that the right date of the permit was 1st November. Urif farmers tried to argue that they never needed the permit to pick in that particular place. In response they were told that they were in the military area and were accused by the soldiers of staging a provocation. They were also threatened with violence, with one of the soldiers grabbing a farmers shoulder to reinforce his threat. Later, a farmer explained to IWPS that this year the village asked for a permit exceptionally, because they wanted soldiers to be present in the light of the extremely violent recent actions of Ytzhar settlers in Burin, Huwwara etc. 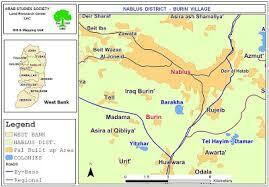 where they attacked farmers and an international and burned an entire field of about 40 olive trees. Initially Urif farmers were told that they could pick on 22nd and 24th. The date was later changed to 26th and 27th. Several villagers told us that it happens every year that they are driven off their land and told to come on a different date, which is then often changed again. Villagers also told us about the history of settler violence in the same location. In 2002 several villagers were seriously injured in a Yitzhar settler attack. One of the women who we picked with had her arm and a shoulder broken by a settler. She was petrified to pick in that location and kept telling everybody to hurry up with the harvest in order to leave the area as soon as possible. There were also attacks reported in the area more recently and only a week ago about 20 olive trees were burned in that location by the Ytzhar settlers. Villagers talked about many such incidents during the previous olive harvests, but also in other times of the year when villagers go to work in their olive fields. An example of army violence and detention of villagers and internationals during planting of olive trees in spring 2013 was caught on camera and you can see a dramatic and inspiring video of the event here http://www.youtube.com/watch?v=qGK7W01Oprg . Other villagers who have land with olive trees in that same area experienced so much harassment and violence by the Ytzhar settlers that they stopped harvesting their olives altogether. IWPS will be accompanying Urif farmers when they return to continue the harvest in the same location on 1 November ´15.